A loaded firearm will not go off by itself; there must be three things present for a firearm to discharge: a weapon, ammunition, and a shooter. Keep firearms and ammunition out of the reach of children. Remember that children are very curious and very ingenious. They know how to open drawers, climb to get to the top of the closet, and reach under mattresses. Keep firearms locked up or have gun safety locks for them. Do not leave the key in the lock. Depending on the type of lock, the weapon can be left loaded and still be safe. Buy a quality lock. Keep ammunition in a separate place, away from the firearms. Educate your children about the proper use of firearms and what to do when they find one. There are several programs, notably the “Eddie Eagle” program sponsored by the National Rifle Association (NRA), which teach kids not to touch guns and to find an adult to tell should they find one. Do not assume that all children have been taught to leave firearms alone. Friends and relatives who don’t have firearms in their homes may not have educated their children on this topic. It is your responsibility to keep them safe, not simply their fault for not knowing. When handling firearms, keep them pointed in a safe direction where no one will get hurt if it should discharge. Keep your finger off the trigger until you are ready to shoot. Do not load the weapon until you are ready to shoot. Never handle firearms if you have been consuming alcoholic beverages or taking medication. Many over the counter medications can cause impairment and can affect your judgment and coordination. If you are on a prescription medication of any kind, ask your physician if they feel it is safe for you to handle firearms before you do so. If you take your children to visit friends’ homes, ask them if they have guns in the house and what safety measures they have taken. Learn enough about firearms to render one safe in the event you encounter one or a child tells you about one they have found. In any event, preserve the firearm until a law enforcement officer arrives to take possession of it. The gun will not go off unless it is mishandled. 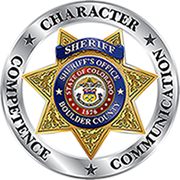 In cooperation with the National Shooting Foundation, the Boulder County Sheriff’s Office provides free gun locks to the citizens of Boulder County. As supplies are limited, there is a limit of two locks per household. They are available Monday-Friday, 8:00 a.m. to 4:30 p.m., at the Records counter of the Sheriff’s Office’ headquarters, the Sheriff’s Superior substation, and the Lyons Town Hall. For more information about Firearm Safety, please call Deputy Kyle Javes at 303-441-3655 or kjaves@bouldercounty.org at the Boulder County Sheriff’s Office.